For home offices that demand productivity\n\nA fully featured printer, scanner, copier and fax designed for home offices. With a large 500-sheet paper cassette and 50-sheet automatic document feeder, the Canon MAXIFY MB2750 Series produces outstanding prints with deep, dense blacks, vivid colours and crisp text using its marker- and friction-resistant DRHD inks. This quality doesnâ€™t come at the expense of speed: print A4 at an ultra-fast 24 ipm in mono and 15.5 ipm in colour, while first page out time (FPOT) is just 6 seconds.\n\nKeep running costs to a minimum\n\nFrom low energy consumption of just 0.2 kWh (TEC) to the individually replaceable colour cartridges, economy is a priority. Black cartridges provide an ISO yield of 1,200 pages and colour cartridges 900 pages. The optional 4-colour multipack contains a full set of replacement inks for even better value.\n\nDesigned for productivity\n\nDouble-sided printing and support for a variety of paper sizes and types, from A4 plain paper to labels, envelopes, photo paper and even two-sided ID card copying makes light work of common office print jobs. Printing, copying, scanning or faxing is just a few taps away, with a highly responsive 7.5 cm (3â€) TFT colour touchscreen and improved interface.\n\nMobile-ready, cloud-ready, work-ready\n\nSupport for Google Cloud Print, Apple AirPrint (iOS), Mopria and the Canon PRINT app provide quick and simple printing and scanning from mobile devices. You can print from the cloud and scan and save documents to cloud services. Supported services include Google Drive, Dropbox, Evernote, OneNote, OneDrive and Concur. Built in Access Point mode means that smart device users can connect to the printer without a Wi-Fi network.\n\nComprehensive monitoring and maintenance capability\n\nIP address filtering enables restricted access options, giving permission to only a select number of users, while SMTP email support allows secure scan-to-email. 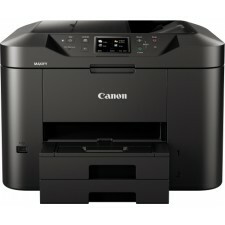 A range of further options allow system administrators to quickly and easily configure the printer and restrict certain operations, such as scan-to-USB.\n\nNetwork integration\n\nIT managers and system administrators will appreciate the Canon MAXIFY MB2750 Seriesâ€™ Simple Network Management Protocol (SNMP) compatibility, making device management and integration into existing office networks easy. SNMP enables a range of maintenance monitoring functions, including ink levels, error status, and page counts.